These are the first Pink and Grey Galahs that I have spotted at the property. They were very common in Perth 250km north – and across most of Australia, but a range map on Wikipedia shows that they don’t normally live this far south. 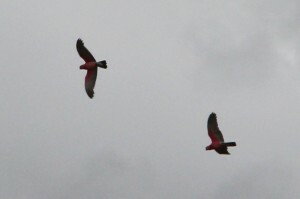 They are noisy, bold and quirky characters and like many parrots, pair bond for life, although they will move on if their original partner dies.